Sign up to track and trace your railcar shipments for free! If you ship or receive freight on rail, at some point you are going to want to have visibility of where those railcars are and when they are going to arrive. The Class I railroads provide web-based railcar shipment tracking tools with varying functionality. This is the beginning of a series of articles that will describe how to use railroad websites to track and manage your shipments for no charge. This article focuses on how to sign up for these accounts and get started. Before you get too excited, you must know that your company needs to be listed as a party on the waybill in order to have visibility of the shipments. Typically this would mean that your company is a Shipper, Consignee, Care Of, and/or Freight Payer party. If your company is not listed on the waybill, you can still track these shipments, but it is a bit more complex: you will need to get a Letter of Authorization from a party that is on the waybill. Letter’s of Authorization can be obtained from the railroad ebusiness help desks. With several of the railroads, this is not too difficult. You must get the party to establish an online account with the railroad and then submit a letter of authorization form. 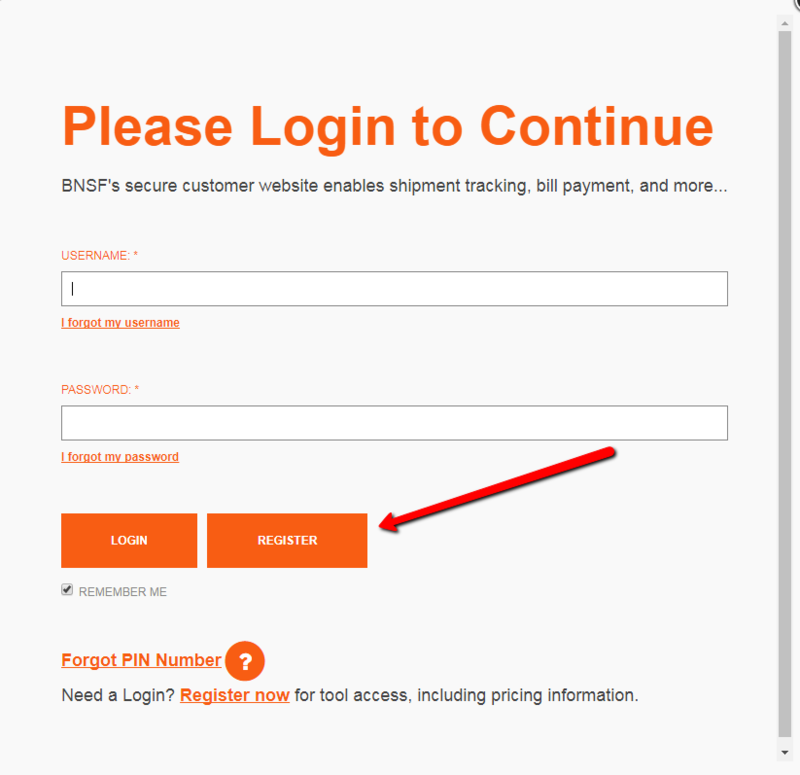 Go to http://www.bnsft.com and on the upper right corner of the page, you will see a Login / Register orange menu; click on it and then click on the Customer Portal link on the left of the lowered orange menu. Click the orange Register button when prompted to login. You will be led through a series of questions to establish your account. When prompted whether you already do business with BNSF, answer Yes if your company ships or receives carloads and BNSF moves the railcar during any part of that trip. Then place a check in the “I would like to register for all BNSF.com Tools” and click Next. There is a nice option where you can enter your mobile number and authorize BNSF to send text alerts about your shipments. You will need to enter your company name – be patient for this one – after you enter the first few letters, it tries to match your company with a list of existing companies. The search time can take a few moments. BNSF has an option where you can model your account to be like an account that is already set up for a co-worker. This is a really great option and can save a lot of set up time. If you do not have any co-workers who have signed up already, be prepared with 1 or 2 recently shipped railcar numbers to provide to help BNSF set up your profile. You can request personal training too. I selected this option and a very helpful individual called me and walked me through the features. After you submit your request, check your email for a link to validate your email address. Read a detailed review of BNSF.com. Go to http://www.cn.ca and on the upper right corner of the page, you will see a Customer Login menu. Click on that menu and then click the Register link. You will be led to a registration form to fill out. Within 2 business days, you will hear back with a confirmation that the account has been established. I received confirmation in less than 1 hour. An email was sent to me confirming my account with a grid showing the tools I had been given access with a label of “Granted”. Most of the tool labels were hyperlinks leading to on-line demonstrations of the tool. Pretty cool. The demo of the Quick Trace tool took 3 minutes and was helpful. When I logged in this time, I was presented with a window requesting me to select the tools that I would like to access. I simply placed checks in all of the boxes below the Monitor Shipments label and clicked the Continue button. There was an option to have a CN eBusiness rep contact me after access had been granted. I was then taken to the Tool Home window. Under the Monitor Shipments label, it still only showed Quick Trace. I assumed that I would get an email in the next couple of days letting me know that I had been approved for the other tools. However, after logging out and logging back in immediately, I now had access to all of the requested tools. Read a detailed review of Canadian National Tools. Go to http://www.cpr.ca and on the upper right corner of the page, you will see a Customer Login menu. Click on that menu and then click the New User? link. You will be led to a registration form to complete. Within 2 business days (I received confirmation in less than 1 hour), you will hear back with a confirmation that the account has been established along with a temporary password. Go back to the Customer Login page and login using the temporary password. You will be prompted that the password has expired and you will need to enter a new password. After logging in, you will find yourself at the Home window. On the lower right corner of the Home window, where you will be taken to after login, there will be a *** Welcome *** message in the Messages Centre window pane. This message simply says that you will need to request tools before you can really do anything in the account. Also, it explains how to make yourself a Central Manager if you are in a supervisory role over people who will be establishing online CP accounts. This will give the ability to authorize employee tool access. I clicked on the Request Tools menu and checked each option that was shipment tracking related and clicked the Submit button. I’ll check back tomorrow. Read a detailed review of CP’s Customer Station. If you go to http://www.csx.com, you will see a link labeled “ShipCSX”, which is the name of their online suite of applications. When you click on this link, you will be taken to http://www.shipcsx.com; click on the “Sign up for eBusiness” link to get your registration started. Click the “CSX Customer” link. Fill out the form. You will have the opportunity to mirror the account of a co-worker, which is a nice feature. You will be asked to provide locations to see shipments originating / terminating. Enter your company name and the address(es) that you ship from or receive railcar shipments. I entered my headquarters and any company locations where we originate and terminate shipments where CSX is involved in the movement. I didn’t request access to any shipping modules, since I only wanted to track locations of railcars. You will need to provide another person’s contact information to vouch for your employment at the company before your account will be approved. After submitting all of my information, I was notified that I will receive an email with my user ID. It came within a few hours. Read a detailed review of ShipCSX. Go to http://www.nscorp.com and on the upper right corner, click the LOGIN menu. Then click the REGISTER link once the menu expands. You will be taken to a form that is pretty straight forward, but you will need to name an NS sponsor, such as a sales representative. If you are not sure, they have a lookup tool to help you find one. Be prepared with at least 1 railcar number of a recent shipment that lists your company on the waybill. I did not select any of the applications listed, assuming that the track and trace was included in the basic account. If memory serves, my account was ready in less than a few days. Read a detailed review accessNS. Go to http://www.up.com and on the upper right corner of the page, click on the MyUPRR Login menu. You will see a link labeled Register; click on that. When prompted, indicate that you are currently doing business with UP and accept the Terms and Conditions. If your company is listed on a waybill where UP moves the railcar for at least part of the shipment, you are considered doing business with UP. During the registration process, be prepared to have the commodity codes that you ship / receive. These codes can be retrieved from bills of lading / waybills and will be labeled “commodity” or “STCC” (Standard Transportation Commodity Code). A great place to look up the codes is http://www.steelroads.com; click on the Reference – Product Codes (STCC) link, click on the Product Codes link; you can then enter key words like “asphalt” and it will return all of the codes including that commodity key word. You should hear back that your account has been created within the same business day or possibly up to 3 days if exceptions are noted. Confirmation for my account came back within an hour or so. The password came in the first email and the user id came in the second along with links and information about popular applications. I can’t wait to try it! Read a detailed review of MyUPRR. This will give you enough to get started. The sites have instructions available on how to track and trace your railcars and some railroads offer personal training. All offer email support. Stay tuned for more detailed articles on each railroad site and some of the quirks that I encountered and how to manage them.